This volume is a comprehensive account of knowledge of the natural world in Europe, ca. 1500-1700. Often referred to as the Scientific Revolution, this period saw major transformations in fields as diverse as anatomy and astronomy, natural history and mathematics. 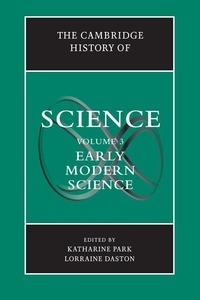 Articles by leading specialists describe in clear, accessible prose supplemented by extensive bibliographies, how new ideas, discoveries, and institutions shaped the ways in which nature came to be studied, understood, and used.